"This recipe using only three chicken breasts is very economical and super delicious! My kids love it and they are extremely picky. The chicken just melts in your mouth and is so flavorful! Garlic bread and salad goes well with this meal. I always taste before serving so I will know what, if anything more, I need to add such as Parmesan, Italian dressing, or milk if it's too thick, etc." Whisk sea salt, black pepper, cumin, paprika, Italian seasoning, and garlic powder together in a bowl. Season chicken breasts with seasoning mixture and place chicken in the slow cooker. Stir cream of mushroom soup, Italian dressing, sour cream, Parmesan cheese, flour, and vinegar together in a bowl; pour over chicken. Shred chicken in the slow cooker using 2 forks. Bring a large pot of lightly salted water to a boil. Cook angel hair in the boiling water, stirring occasionally until cooked through but firm to the bite, 4 to 5 minutes. Drain. 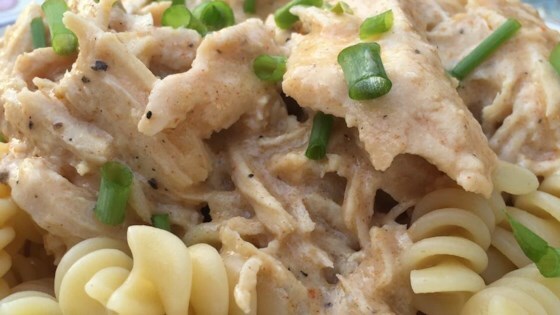 Serve chicken over angel hair pasta. The malt vinegar was used in place of wine since I was out last time I made this. Everyone said it was the best to-date so I incorporated it into the official recipe. White wine can be used in place of malt vinegar if desired. Cream of chicken soup can be substituted for cream of mushroom if desired. I don't measure the seasonings, so 1 teaspoon for each is approximate. I have to agree, you don't think these spices would work, but it totally does! Followed this recipe by the book, and it turned out perfect. The whole family loved it! Made this recipe as written except I cooked it 3 hours on high in the crockpot because of time. Turned out great! Sauce is wonderful. Thanks for this deliciously easy recipe.